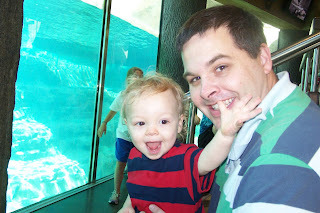 Last weekend we made our first trip to the zoo. Aside from being sleepy from missing naps, the boys really seemed to enjoy it. 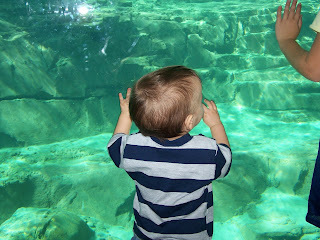 Hayden waved "hi" to most of the animals. I think their favorite was the polar bear - at least it was my favorite. The monkeys were funny to watch too. Here are some pics from the day. 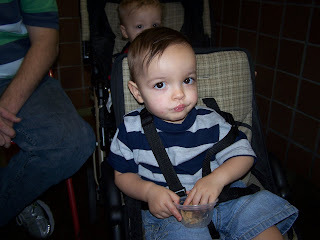 Here is one of the few times the boys got to be out of the stroller and walking around. 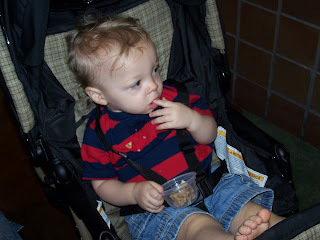 It was a challenge deciding when to keep them in the stroller and when to get them out, but we did okay. I don't remember what they were looking at here, but as you can see "Puppy" had to go with us. I eventually had to hide Puppy because I was afraid he would get lost - and that would make for a BAD day! 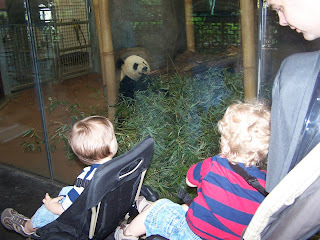 Here are all 3 boys looking at the Panda Bear. Here we are at the Polar Bear exhibit. The boys seemed to like this. The fact that they got to walk around may have had something to do with it. Carson seemed interested in a couple of older girls while there. I'm not sure if he is looking for the Polar bear, or if he is looking at the girl :). We had to take a break and eat some lunch. I just happened to bring some little cups for them to eat snacks in, but they ended up eating their lunches in them. They did really well. 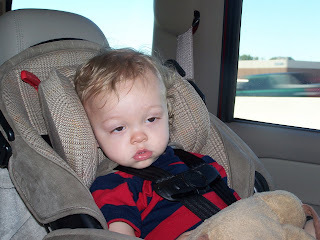 As you can see, Hayden was very comfortable with his feet propped up on his Bubby's seat. 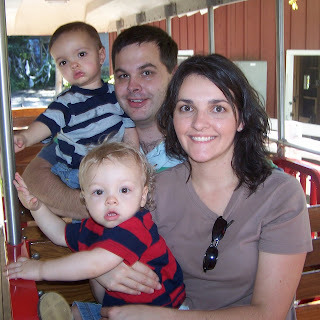 After lunch, we took the train ride around the farm. It was an okay ride for me and Phillip, but the boys really seemed to enjoy it. Luckily, the driver of the train agreed to take our picture. As I mentioned earlier, the boys pretty much missed their naps. Here they are on the ride home. Carson went to sleep pretty early, but Hayden held on as long as he could. 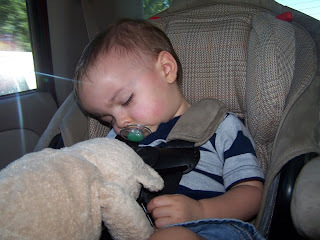 I think we were pretty close to home before he finally went to sleep. The zoo is the best! As much as we hate paying $10 every time we go to the zoo, the double stroller they have is wonderful there! It is easy for the girls to climb in and out of to see all the animals they want to get "close" to, but when they get tired they can still ride. It is wonderful! I am glad you enjoyed it, we always do! 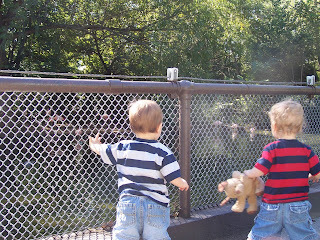 It looks like Hayden and Carson enjoyed their first trip to the zoo! We went a few months ago and Hayden loved it as well. Glad you guys had fun!